Before you purchase a new network switch or router, we recommend running some tests to ensure the device has enough buffering to handle multiple high-speed flows. This page describes a test methodology that will help you verify the network switch can handle large science data flows. 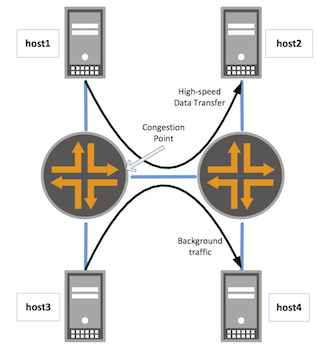 You'll need 4 hosts capable of doing 10Gbps, and 2 network switches, configured as shown in the diagram on the right. We recommend configuring everything with 9K MTUs. The basic idea is to generate 2Gbps background load between 2 hosts, and then use the other 2 hosts to oversubscribe the link, and see how TCP behaves. If the switch has enough buffering, TCP will detect loss, back off, and still get reasonable performance. If the switch does not have enough buffer space, there will be many more packets dropped, and TCP performance will be very unstable. Next, use tc to add simulate a high latency path. Do this for the ethernet interface on both host1 and host2, so that the path is symmetric. Rerun your baseline test to make sure you can still get 10G. Note that should take a bit longer for TCP to ramp up. If your switch has enough buffering, you should see a stable 5Gbps of TCP throughput. Our testing has shown that 64MB of buffer are needed to get good performance. We'd love to hear about your test results. Please send them to fasterdata@es.net. Note there are minimal retransmits, and throughput is stable after ramping up. Note there are multiple periodic retransmits, and throughput is not stable. Also note that these results are with 9K MTUs, and TCP recovers slower with the default 1500 byte MTU. And note that TCP throughput on a lossy path is directly related to latency, so performance would be much worse on a longer path. More details are in this talk from NANOG, June 2015.